Eastman Johnson’s painting of fugitive slaves helps address ways to teach a pivotal question in U.S. history: Did Lincoln free the slaves—or did the slaves free themselves? Eastman Johnson, The Ride for Liberty- The Fugitive Slaves, c. 1862. Oil on board, 21 15/16 x 26 1/8 inches. Source: The Brooklyn Museum. Gift of Miss Gwendolyn O. L. Conkling. “A veritible [sic] incident / in the civil war seen by / myself at Centerville / on this morning of / McClellan’s advance towards Manassas March 2, 1862 / Eastman Johnson.” The inscription on the back of Eastman Johnson’s A Ride for Liberty—The Fugitive Slaves records the painting’s “eyewitness” source on a Civil War battleground. By 1862, Johnson, a genre painter from Maine, had gained a reputation for his paintings depicting African Americans. A Ride for Liberty would become one of his most renowned works, in part because it illuminates a historical problem that still addresses the way we teach a pivotal moment in U.S. history: Did Lincoln free the slaves—or did the slaves free themselves? A Ride for Liberty provides an entry-point for teaching about the Civil War. Some of the historical themes present in the painting include conflict, freedom, change, power, and justice. The painting illustrates the experience of “contraband” slaves during the war. As a means to control their own destiny, African-American men and women escaped from their owners and arrived at Union camps. In exchange for their freedom, slaves offered labor and knowledge of local environments to advance military campaigns for a then losing Union army. In response to the overwhelming number of slaves who risked their lives in pursuit of freedom, General Benjamin Butler declared all slaves that reached Union camps as “contraband of war.” A Ride for Liberty demonstrates a moment during the war where slaves were instrumental in obtaining their own freedom. Thus, the painting reveals some of the social and political forces behind the Emancipation Proclamation by portraying the actions of runaway slaves that helped shape Lincoln’s policy. 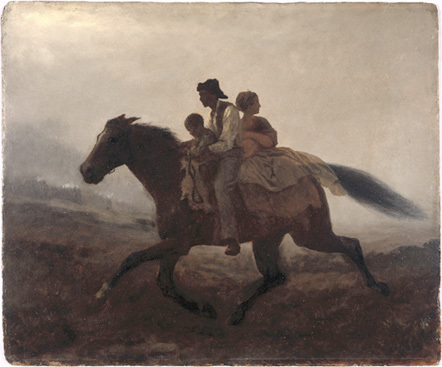 Johnson’s painting depicts a slave family on horseback—father, mother, child, and infant. The painting’s title and tone, represented by a dimly lit color scheme, suggests they are traveling in the early dawn, fleeing to a safe environment. In the distance, one identifies light reflected from bayonets. The painting shows the fleeing slave family caught between two sides: repressive slave life on the plantation and the possibility of freedom within Union army lines. Although the painting offers a somewhat romantic view of slave resistance, using dusty colors and active brushstrokes, it also presents a departure from the more commonly known contemporary illustrations of African Americans as shiftless, childlike, or bestial. The painting portrays a slave family in a dignified manner, providing little detail in facial expression or indication of plantation-life status. A Ride for Liberty highlights the courage of individual slaves in pursuing the hopes and dreams of a fair and just society. Teachers and students may work with Johnson’s caption as a way to grapple with the historical content of the image. Students can construct a narrative about the individuals seen on horseback: who are these people? Do they comprise a family? Are they mixed race? What happened to the families of slaves who ran away? How did “contraband” slaves interact with each other? What were some of the problems faced by “contraband” slaves on the battlegrounds? What did freedom mean? Eastman Johnson’s A Ride for Liberty offers historical information not readily apparent in text documents and presents students with the opportunity to deepen their understanding of Civil War history and slave resistance.